When displaying a list, or a grid, you may have a common sort order, column view, or search that you repeat every time you look at the grid. 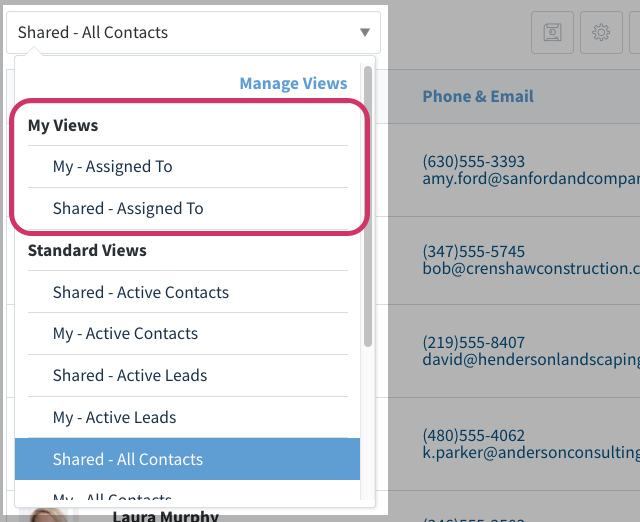 Custom Filter Views allow you to save this personal filter view and even share it with other Method Users. 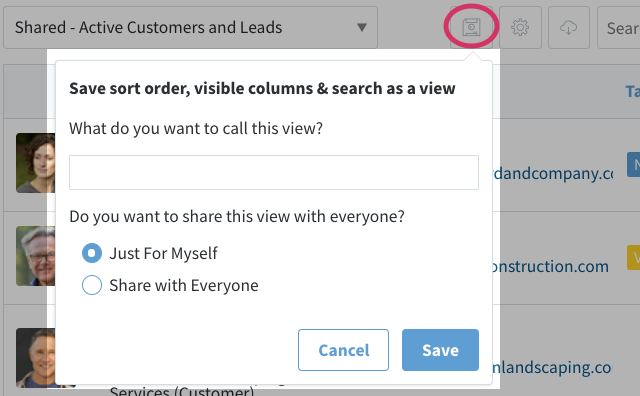 In order to create a custom filter view, you will first need to set the list up to display what you want. Select a view filter, choose which columns you want visible, sort it, and specify search terms. Note: In the below example, the Contacts grid will be used. However, you can save your custom filter view on any grid. 1. When you have your custom filter view, select the save icon beside the gear icon. 2. You will be prompted for a name for the view. Fill in a name which will appear in the filter view dropdown. 3. You will also be asked if the view will be shared with other Method users, or if it's just for yourself. 4. When you hit Save, your custom filter view is complete! Once you have created a custom filter view, you can find and select it from the view filter in the upper left of a grid display. My Views - These are all the custom filter views you have created. This including both individual and shared. Standard Views - These are the views that comes stock with the app. When you have created custom filter views, you can edit them by selecting the Manage Views link in the view filters menu. 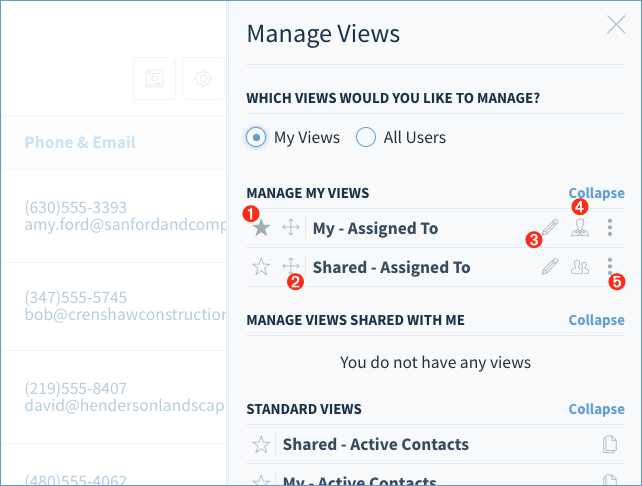 At the top, you will see a section called Which Views Would You Like to Manage? This will show up if the Method User is an Administrator. This will allow the admin to manage custom filter views for the grid. Default (⭑) - Set which filter view is the default view. View Order (Arrows) - Change the order of the custom filter views. Edit (Pencil) - Edit the name of the custom filter view. Personal View or Shared View (People) - This icon indicates if it's a shared or personal view. More (⋮) - Expand to get more options. When you expand the vertical ellipsis (⋮) for an individual custom filter view, you will see the following options. Hide View - View will be hidden from the filter view. Change Sort Criteria - Edit the sorting for the custom filter view. Edit Filter Criteria - Change the Filter Criteria for the custom filter view. 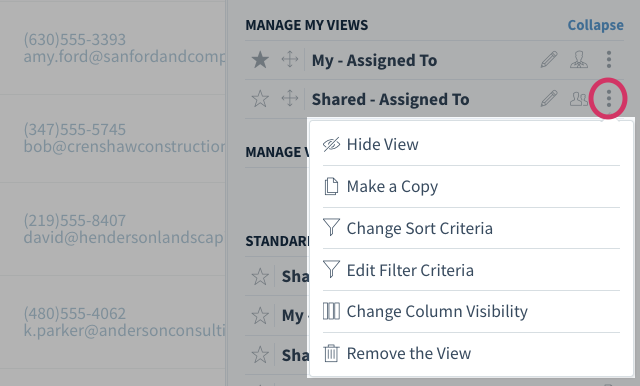 Change Column Visibility - Turn on and off columns for the custom filter view. Remove the View - Delete the custom filter view.